Well that’s not exactly true. You CAN wear your baby in footie pajamas. Here are a few tips to make you successful in this endeavor. Size up the pajamas if you can. Make sure that there’s extra room in the foot area before you start the carry. This is achieved by pulling the fabric at the feet. Make sure the toes are not bunched in the foot area once settled into the carrier. 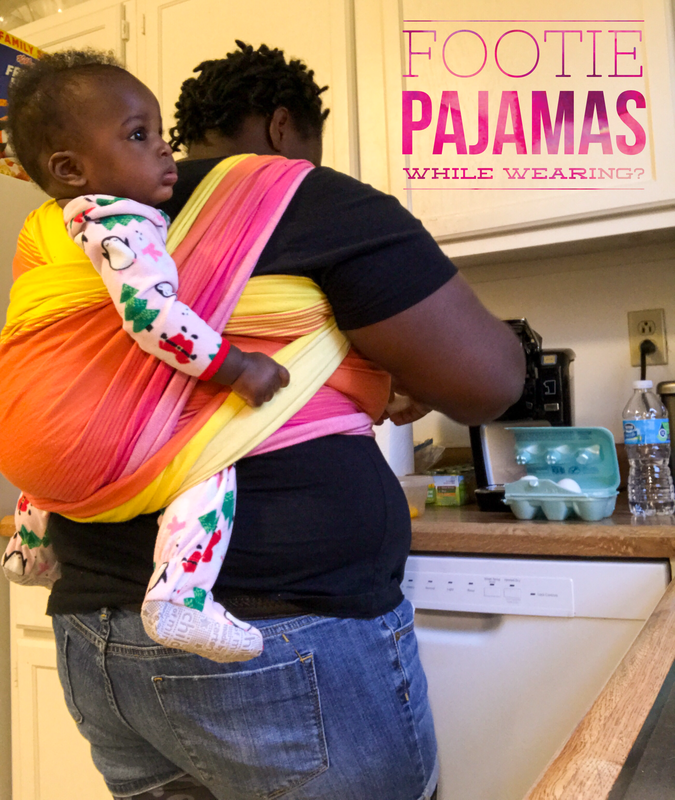 When the pajamas don’t have enough extra room, not only will it make things more uncomfortable for the wearee, the wearer may have difficulty getting a good seat when wrapping or using a ring sling. When I tried this out, I could not get the fabric in the back of the knee to form the seat. I could only get the fabric as far as the pajamas let me. If the footie pajamas are snug on the child’s feet when in sitting position before putting them into the carrier, I’d skip wearing in those pajamas. Who am I kidding–I’d probably cut the feet off of the pajamas so we could use them longer! 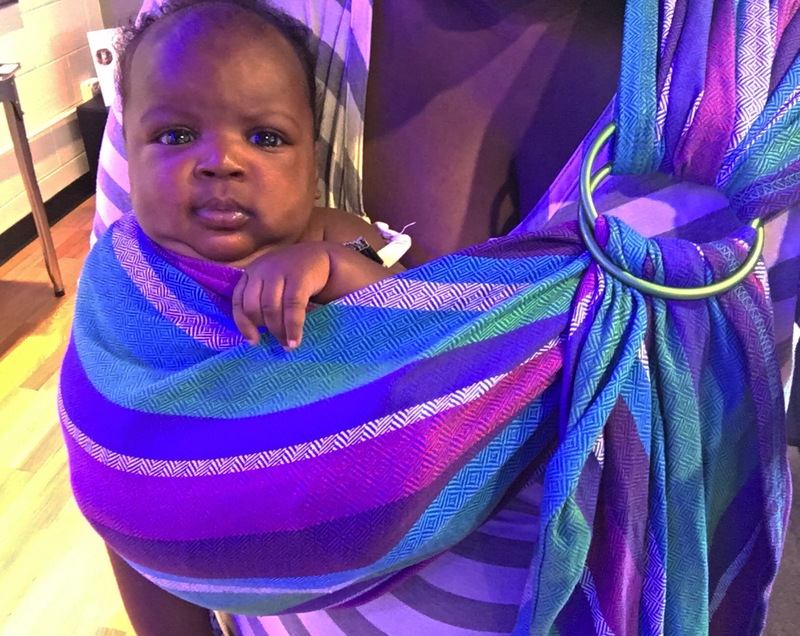 I recently had the privilege of hosting a Baby-Doo Orchidej ring sling from Marsupial Mamas. I absolutely LOVED the colors! When I opened the package the first thing I did was gasp at the colors. 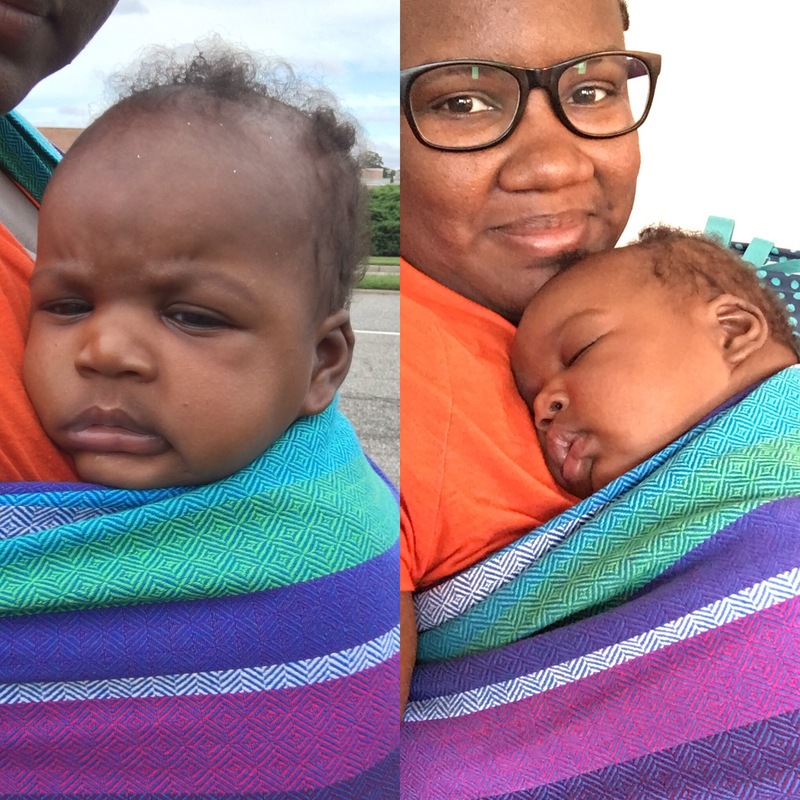 This 100% cotton ring sling was a size medium which is juuust long enough for me to work with. I usually use a large or extra large sling. I used this exclusively with Minerva. She is 11 pounds, 21 inches, and 3 months old. She fell asleep in this sling a lot. 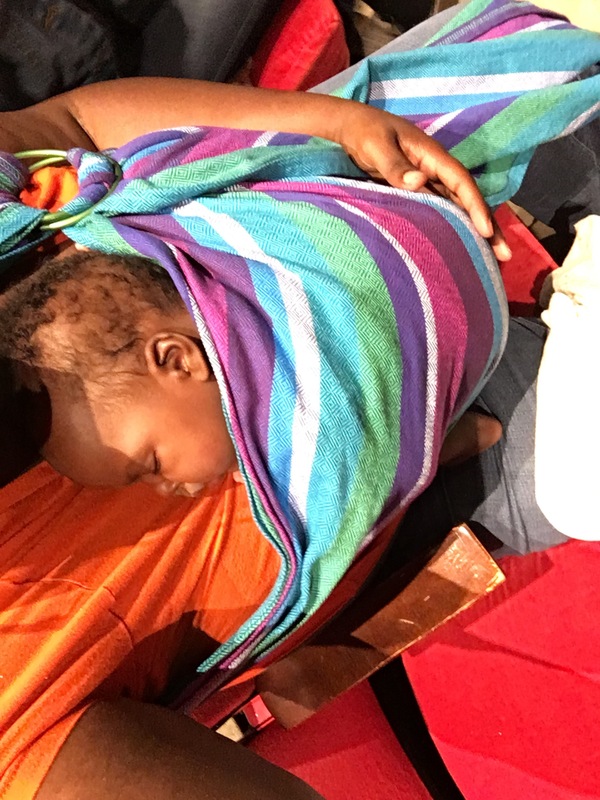 I used this Baby-Doo ring sling for a few weeks. It was super soft! It was on the thin side of medium and was excellent in the hot weather we had. It was really comfortable on my shoulder. I really like how easy it was to get through the rings. I usually nurse while wearing so adjusting through the rings is incredibly important for me. A milky nap at the doctor’s office. Necklace by The Vintage Honey Shop. 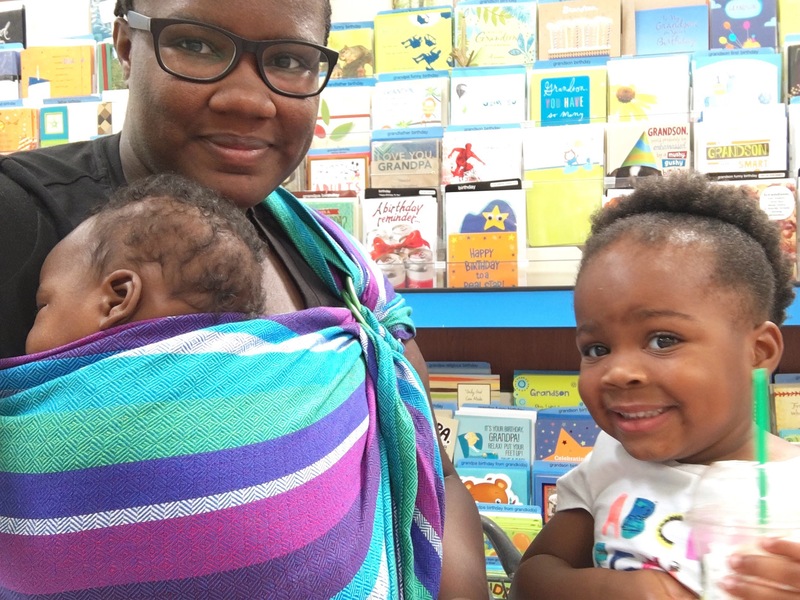 Ring slings are my go-to carrier especially when I need something quick to toss in my bag. 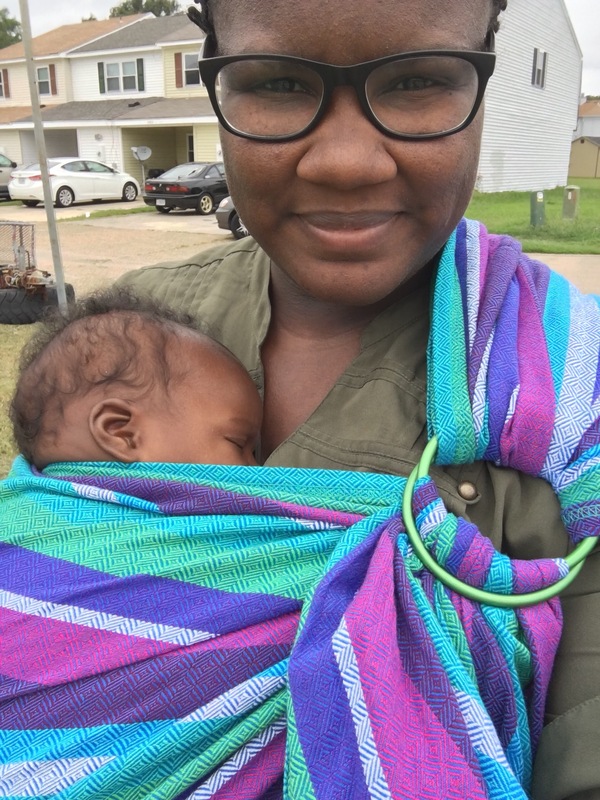 This ring sling passed the fit-in-my-bag test! It isn’t bulky at all and did not take up much room in my diaper bag or my carry-all purse. I would recommend this sling to wearers of all skill level. This would be so great for someone who is brand new to ring slings. It was so easy to get through the rings. I loved it with my baby! 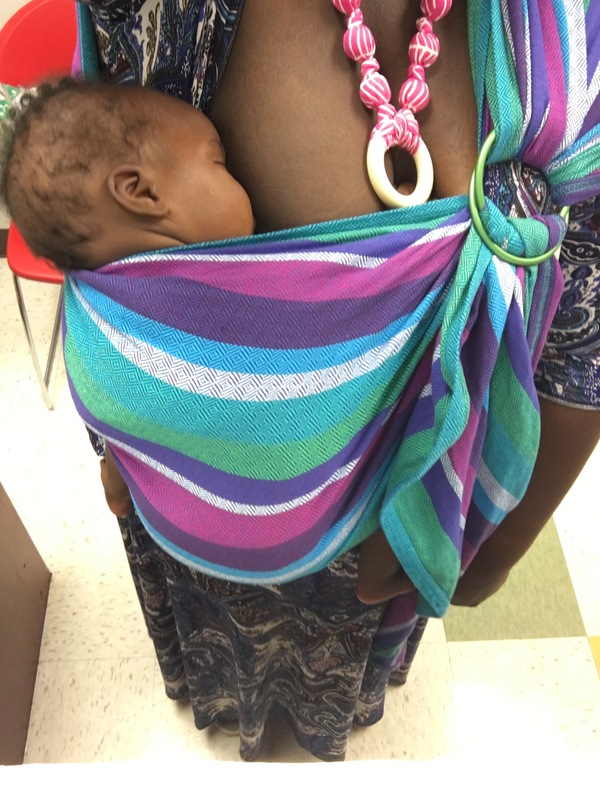 I would definitely recommend this ring sling to friends. Especially friends who look great in jewel tones! Check out Baby-Doo on Facebook and Instagram! Follow Marsupial Mamas on Facebook and Instagram, and be sure to join Marsupial Mamas Neighborhood for all kinds of fun and to hear about sales first!